Our mission is to make a positive difference to peoples lives by providing and maintaining good quality affordable homes and services and participating in wider initiatives which contribute to sustainable communities. Rosebery Housing Association was formed in 1994 and today owns more than 2,500 affordable homes across Surrey and West Sussex, ranging from one-bedroom flats to four-bedroom family homes. We are a charitable registered provider and committed to providing good quality homes and services. The focus of our property portfolio is in Epsom and Ewell, where we own three-quarters of all affordable housing. We are proud to be a local business that creates sustainable communities by forging strong local partnerships, working closely with residents and communities and creating local jobs. The map below outlines the catchment area of where our homes are. 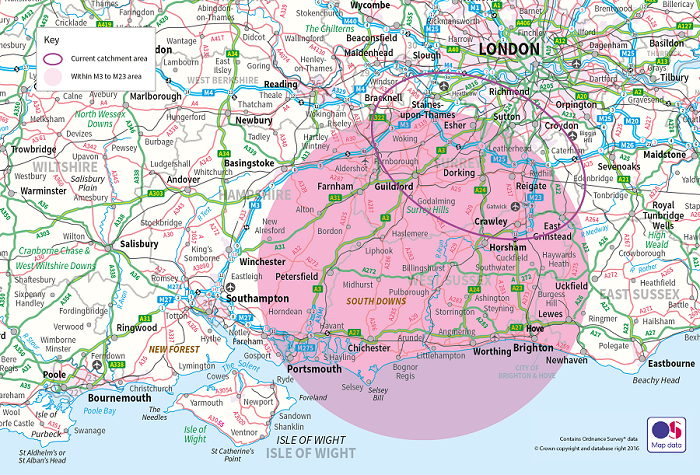 The pink circle marked on the map highlights the area radius where we wish to develop homes in the future. Value for Money (VfM) means managing our resources economically, efficiently and effectively to provide quality services and homes – put simply it is business efficiency. We measure VfM in the context of meeting our objectives. We aim to fulfil our objectives by implementing the strategic direction outlined in our Corporate Plan with each reflecting our vision ‘To make a positive difference’. VfM is embedded in all that we do. We evidence savings and staff are encouraged to challenge established ways of working to inspire savings. Why is VfM so important? There is a greater emphasis on VfM, due mostly to the need to stretch significantly reduced public funding, so that development can continue and the provision of affordable housing can continue to grow. In the current economic environment of increasing costs of funds and the impact of the proposed welfare benefit reforms, VfM has a crucial role to play in enabling development to continue, and to improve service standards for our customers so that they receive VfM for the rent they pay.